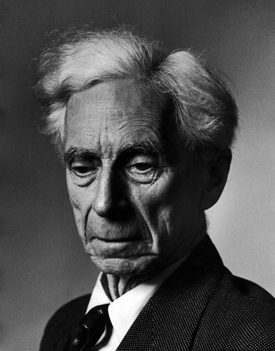 Bertrand Russell (1872-1970) was a British philosopher, logician, essayist and social critic best known for his work in mathematical logic and analytic philosophy. His most influential contributions include his championing of logicism -- the view that mathematics is in some important sense reducible to logic; his refining of Gottlob Frege's predicate calculus -- which still forms the basis of most contemporary systems of logic; his defense of neutral monism -- the view that the world consists of just one type of substance which is neither exclusively mental nor exclusively physical; and his theories of definite descriptions and logical atomism. Together with G.E. Moore, Russell is generally recognized as one of the main founders of modern analytic philosophy. Together with Kurt Gödel, he is regularly credited with being one of the most important logicians of the twentieth century. Over the course of a long career, Russell also made significant contributions to a broad range of other subjects, including the history of ideas, ethics, political theory, educational theory and religious studies. In addition, generations of general readers have benefited from his many popular writings on a wide variety of topics in both the humanities and the natural sciences. Like Voltaire, to whom he has been compared, he wrote with style and wit and had enormous influence. 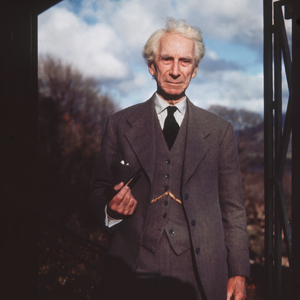 After a life marked by controversy -- including dismissals from both Trinity College, Cambridge, and City College, New York -- Russell was awarded the Order of Merit in 1949 and the Nobel Prize for Literature in 1950. Noted also for his many spirited anti-nuclear protests and for his campaign against western involvement in the Vietnam War, Russell remained a prominent public figure until his death at the age of 97. 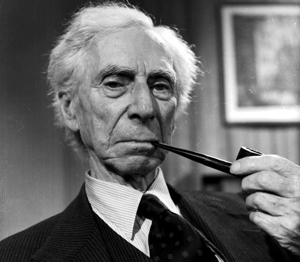 Bertrand Russell was born on 18 May 1872 in Trellech, Monmouthshire, into an influential and liberal family of the British aristocracy. His parents, Viscount and Viscountess Amberley, were radical for their times. Lord Amberley consented to his wife's affair with their children's tutor, the biologist Douglas Spalding. Both were early advocates of birth control at a time when this was considered scandalous. Lord Amberley was an atheist and his atheism was evident when he asked the philosopher John Stuart Mill to act as Russell's secular godfather. Mill died the year after Russell's birth, but his writings had a great effect on Russell's life. His paternal grandfather, the Earl Russell, had been asked twice by Queen Victoria to form a government, serving her as Prime Minister in the 1840s and 1860s. The Russells were prominent in England for several centuries before this, coming to power and the peerage with the rise of the Tudor dynasty. They established themselves as one of Britain's leading Whig families, and participated in every great political event from the Dissolution of the Monasteries in 1536-1540 to the Glorious Revolution in 1688-1689 and the Great Reform Act in 1832. Russell's adolescence was lonely, and he often contemplated suicide. He remarked in his autobiography that his keenest interests were in religion and mathematics, and that only his wish to know more mathematics kept him from suicide. He was educated at home by a series of tutors. At age 11, his brother Frank introduced him to the work of Euclid, which transformed Russell's life. During these formative years he also discovered the works of Percy Bysshe Shelley. In his autobiography, he writes: "I spent all my spare time reading him, and learning him by heart, knowing no one to whom I could speak of, what I thought or felt. I used to reflect how wonderful it would have been to know Shelley, and wonder whether I should meet any live human being with whom I should feel so much sympathy." Russell claimed that beginning at age 15, he spent considerable time thinking about the validity of Christian religious dogma, which he found very unconvincing. At this age, he came to the conclusion that there is no free will and, two years later, that there is no life after death. Finally, at the age of 18, after reading Mill's "Autobiography", he abandoned the "First Cause" argument and became an atheist. Russell began his published work in 1896 with German Social Democracy, a study in politics that was an early indication of a lifelong interest in political and social theory. In 1896 he taught German social democracy at the London School of Economics, where he also lectured on the science of power in the autumn of 1937. He was a member of the Coefficients dining club of social reformers set up in 1902 by the Fabian campaigners Sidney and Beatrice Webb. He now started an intensive study of the foundations of mathematics at Trinity. In 1898 he wrote An Essay on the Foundations of Geometry which discussed the Cayley-Klein metrics used for non-Euclidean geometry. He attended the International Congress of Philosophy in Paris in 1900 where he met Giuseppe Peano and Alessandro Padoa. The Italians had responded to Georg Cantor, making a science of set theory; they gave Russell their literature including the Formulario Mathematico. Russell was impressed by the precision of Peano's arguments at the Congress; read the literature upon returning to England; and came upon Russell's paradox. In 1903 he published The Principles of Mathematics, a work on the foundations of mathematics. It advanced a thesis of logicism, that mathematics and logic are one and the same. At the age of 29, in February 1901, Russell underwent what he called a "sort of mystic illumination", after witnessing Whitehead's wife's acute suffering in an angina attack. "I found myself filled with semi-mystical feelings about beauty -- and with a desire almost as profound as that of the Buddha to find some philosophy which should make human life endurable", Russell would later recall. "At the end of those five minutes, I had become a completely different person." In 1905 he wrote the essay "On Denoting", which was published in the philosophical journal Mind. Russell became a fellow of the Royal Society in 1908. The three volume Principia Mathematica, written with Whitehead, was published between 1910 and 1913. This, along with the earlier Principles of Mathematics, soon made Russell world-famous in his field. In 1910 he became a lecturer in the University of Cambridge, where he was approached by the Austrian engineering student Ludwig Wittgenstein, who became his PhD student. Russell viewed Wittgenstein as a genius and a successor who would continue his work on logic. He spent hours dealing with Wittgenstein's various phobias and his frequent bouts of despair. This was often a drain on Russell's energy, but Russell continued to be fascinated by him and encouraged his academic development, including the publication of Wittgenstein's Tractatus Logico-Philosophicus in 1922. Russell delivered his lectures on Logical Atomism, his version of these ideas, in 1918, before the end of the First World War. Wittgenstein was, at that time, serving in the Austrian Army and subsequently spent nine months in an Italian prisoner of war camp at the end of the conflict. Russell's main contributions to logic and the foundations of mathematics include his discovery of Russell's paradox (also known as the Russell-Zermelo paradox); his development of the theory of types; his championing of logicism -- the view that mathematics is, in some significant sense, reducible to formal logic; his impressively general theory of logical relations; his formalization of the mathematics of quantity and of real numbers; and his refining of the first-order predicate calculus. Russell discovered the paradox that bears his name in 1901, while working on his Principles of Mathematics (1903). The paradox arises in connection with the set of all sets that are not members of themselves. Such a set, if it exists, will be a member of itself if and only if it is not a member of itself. Russell's response to the paradox came between 1903 and 1908 with the development of his theory of types. It was clear to Russell that some form of restriction needed to be placed on the original comprehension (or abstraction) axiom of naïve set theory, the axiom that formalizes the intuition that any coherent condition (or property) may be used to determine a set. Of equal significance during this period was Russell's defense of logicism, the theory that mathematics is in some important sense reducible to logic. Russell spent the 1950s and 1960s engaged in political causes primarily related to nuclear disarmament and opposing the Vietnam War -- see also Russell Vietnam War Crimes Tribunal. The 1955 Russell-Einstein Manifesto was a document calling for nuclear disarmament and was signed by 11 of the most prominent nuclear physicists and intellectuals of the time. He wrote many letters to world leaders during this period. In 1956, immediately before and during the Suez Crisis, Russell expressed his opposition to what he viewed as European imperialism in the Middle East. He viewed the crisis as another reminder of what he saw as a pressing need for a more effective mechanism for international governance, and to restrict national sovereignty to places such as the Suez Canal area where general interest is involved. At the same time the Suez Crisis was taking place, the world was also captivated by the Hungarian Revolution and the subsequent crushing of the revolt by intervening Soviet forces. Russell attracted criticism for speaking out fervently against the Suez war while ignoring Soviet repression in Hungary, to which he responded that he did not criticize the Soviets because there was no need. Most of the so-called Western World was fulminating. Although he later feigned a lack of concern, at the time he was disgusted by the brutal Soviet response, and on November 16, 1956, he expressed approval for a declaration of support for Hungarian scholars which Michael Polanyi had cabled to the Soviet embassy in London twelve days previously,shortly after Soviet troops had already entered Budapest. In November 1957, Russell wrote an article addressing US President Eisenhower and Soviet Premier Khrushchev,urging a summit to consider the conditions of co-existence. Khrushchev responded that peace could indeed be served by such a meeting. In January 1958, Russell elaborated his views in The Observer, proposing a cessation of all nuclear weapons production, with Britain taking the first step by unilaterally suspending its own nuclear-weapons program if necessary, and with Germany "freed from all alien armed forces and pledged to neutrality in any conflict between East and West". US Secretary of State John Foster Dulles replied for Eisenhower. The exchange of letters was published as The Vital Letters of Russell, Khrushchev, and Dulles. Russell was asked by The New Republic, a liberal American magazine, to elaborate his views on world peace. He suggested that all nuclear-weapons testing and constant flights by planes armed with nuclear weapons be halted immediately, and negotiations be opened for the destruction of all Hydrogen bombs, with the number of conventional nuclear devices limited to ensure a balance of power. He proposed that Germany be reunified and accept the Oder-Neisse line as its border, and that a neutral zone be established in Central Europe, consisting at the minimum of Germany, Poland, Hungary, and Czechoslovakia, with each of these countries being free of foreign troops and influence, and prohibited from forming alliances with countries outside the zone. In the Middle East, Russell suggested that the West avoid opposing Arab nationalism, and proposed a United Nations peacekeeping force to guard Israel's frontiers to ensure that Israel was protected from aggression and prevented from committing it. He also suggested Western recognition of the People's Republic of China, and that it be admitted to the UN with a permanent seat on the UN Security Council. Russell published his three-volume autobiography in 1967, 1968, and 1969. Russell made a cameo appearance playing himself in the anti-war Hindi film Aman which was released in India in 1967. This was Russell's only appearance in a feature film. Russell died of influenza on 2 February 1970 at his home, Plas Penrhyn, in Penrhyndeudraeth, Merionethshire, Wales. His body was cremated in Colwyn Bay on 5 February 1970. In accordance with his will, there was no religious ceremony and his ashes were scattered over the Welsh mountains later that year.